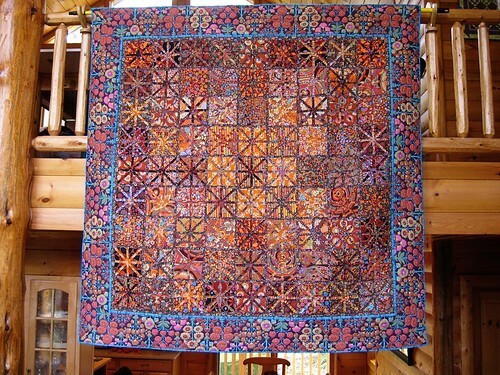 I finished the quilting in time to show this quilt in our little quilt show in August. This is the second project I have completed on my new Gammill Vision 26-10. 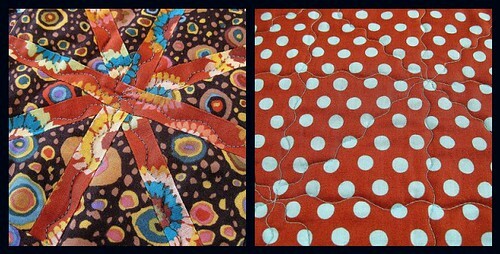 The quilting was really very simple. 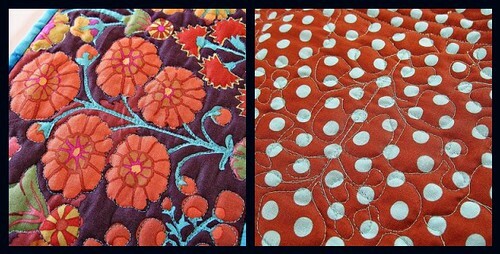 I just quilted squiggly lines in all the 1/2 inch inserts. This resulted in a sort of lattice pattern on the back. Here is a view from the top of the quilt and from the back. As you can see, I used a turquoise thread and a turquoise and brown backing fabric. In the border, I simply outlined all the flowers and stems in the border fabric. This is a view from the top of the quilt and from the back. The only other quilting I did was to stitch in the ditch on each side of the narrow turquoise inner border. The quilt is bound in the same turquoise batik fabric.